agency is working continuously on the Lodz real estate market since 1995. Trusted us thousands of individual and institutional customers, also many well-known companies. Among the existing customers the Agency are; BOSCH, INDESIT, INFOSYS, DRAGADOS, VIAS Y CONSTRUCCIONES, CORNING, PHILIPS, SKANSKA, BUDIMEX, REXAM, SWM POLAND, APSYS (MANUFACTURA LODZ), ECE (GALERIA ŁÓDZKA), MEDIAMARKT, GEANT, CARREFOUR, TESCO, MACRO, OPUS FILM, CREDIT TRADE, FASHION POLAND, KAMIS , KOMPAP, BUSZREM, STUDIO 3 INVESTMENT, BRE BANK SA and others. both the business owner Andrzej Dębski, as well as acting as Director of the Company Anetta Dębska are graduates of postgraduate Real Estate Market completed at the University of Lodz, both are licensed real estate agents, Andrzej Debski number 487, Anetta Dębska with the number 6292. Anetta Dębska also has a licensed property manager with a number 26099. All licenses granted by the Ministry of Infrastructure and Development. Licensed agents are for years members of the local professional organization under the name Association of Realtors of Central Poland and participate on a regular basis in training in the real estate market organized by the Association. All staff working in the AN PROPERTY has higher education, economic or legal. acting in accordance with the applicable provisions, the businessman has the civil liability insurance policy bought in the PZU SA company, mandatory for this type of business liability insurance. The Agency presents its customers offers both on the website www.property.com.pl, as well as on all major web portals operating in the real estate industry. In addition, the offer can be presented in the local press, mostly in Wednesday's Supplement to the Official Lodz called Gratka. Agency provides full service in sale and acquisition and lease and rental of houses, dwellings, premises and utility objects (office, service, commercial, warehouse and production) and the sale and lease of building, recreational, agricultural and industrial areas. Agency service also includes completing and initial verification of documents confirming the legal status of the property or to the premises of the cooperative law, the house needed to sell, such as excerpts from the land registry, extracts from the register of land and buildings, the relevant certificate of the housing associations, extracts of zoning plans etc. The company works with reputable notary offices, providing professional legal services in the preparation and sale agreements with banks funding real estate market. Company employees speak English, which provides support for foreigners. in order to improve customer service AN PROPERTY participates in a computer network called Central Real Estate Bank, which consists of more than 25 major real estate offices in Lodz. It is a modern form of cooperation between professional offices, which enables the exchange of offers via the Internet and work on a common database of real estate listings. Customer interested in buying a property coming to AN PROPERTY receive access to listings of all participants in the network offices, and customer selling, submitting an offer for exclusivity, is confident that he will find it in all the offices within the network. This is called multiple system offering, the English abbreviation MLS. agency cooperates with reputable notary offices, providing professional legal services in the preparation and sale agreements with banks funding real estate market. office is located in the very center of Lodz, on Kosciuszki Alee no. 8, near the intersection with Zielona Street, where there is ample parking for customers with cars and numerous public transportation, both tram and bus. 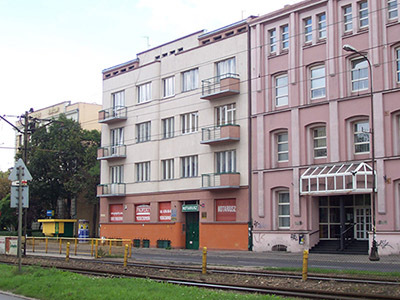 Office location in the city center, at the through street, on the ground floor of the building at Kosciuszki Alee no. 8, allows easy access to the office all customers. 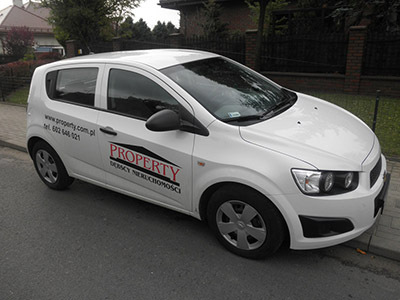 the company offers car missions, resulting in immediate visitation and presentation of the property. We arrive to the customer we deliver customers to the property. Car - mobile advertising company. brokers licensed Anetta Dębska and Andrzej Debski offer their knowledge and experience gained through 20 years of activity in practice and in training, are for your guide to real estate market, to help invest, raise capital, draw up opinions in the field of real estate.